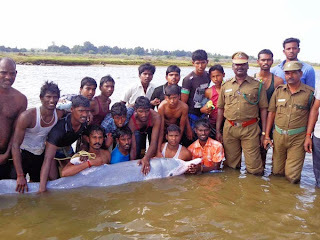 INDIA - A dolphin weighing some 300 kilos and measuring more than 6 feet in length was recently discovered stranded in the freshwater river at Kollidam, near Nagapattinam, Tamilnadu, India. A group of local fishermen, along with officials from the Department of Forestry reacted quickly to safely capture the struggling dolphin which had been trying to find its way upstream. Locals say that this type of stranding is very rare. The group helped the dolphin by taking it to the nearby Port of Palayar, where it was successfully reintroduced to the open sea.